You don't love pumpkin pie? You're like me. Looking for something different for Thanksgiving? 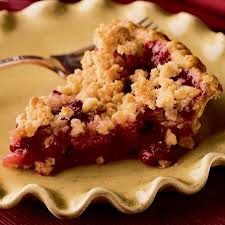 Try this delicious cranberry apple pie, which my wife and her fellow members of the Grace Church cooking crew served at our Harvest Dinner, and which was a great success. 4 tablespoons cold butter, cut into 1/4 inch pieces. Heat oven to 400 degrees. Line a nine inch standard pie pan with the pastry; flute the edges. Slice the apples thinly and mix them in a bowl with the cranberries. Add and mix sugar, lemon juice, and flour. Put the filling in the pastry, smoothing the top. Put in oven and bake for thirty minutes. While the pie is baking, mix the flour, sugar, and cinnamon for the topping in a bowl. Add the butter and combine it with the other ingredients until the mixture looks like coarse crumbs. When thirty minutes are up, take the pie from the oven, reduce the temperature to 375 degrees, spread the topping on the pie, and bake for another thirty minutes, or until the top is a golden brown. Let it cool for two hours before serving. Image and recipe thanks to spoonful.com. Addendum: In today's Times, Ian Fisher seconds Calvin Trillin in recommending spaghetti carbonara as a substitute for turkey. Zelda will be thankful.